AmScope Mechanical Stage For AmScope M148, M149, M150, M152, M158 Series Microscopes by AmScope at KBFS. MPN: MS90. Hurry! Limited time offer. Offer valid only while supplies last. 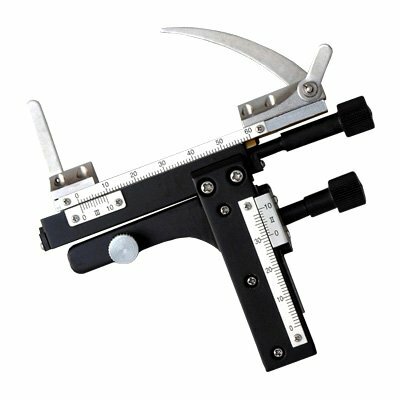 This is a brand new graduated mechanical stage attachment for AmScope M148, M149, M150, M152 series microscopes. It holds standard microscope slides. This is a brand new graduated mechanical stage attachment for AmScope M148, M149, M150, M152 series microscopes. It holds standard microscope slides. It has a center mount screw with two locating pins at 1-3/8" (35mm) apart. Its travel ranges are 1.2" (30mm) and 2.0" (50mm). Features & Specifications: Two Locating Pins: 1-3/8" (35mm) apart Travel Range: 1.2" (30mm) and 2.0" (50mm) 1-Year Warranty Unbeatable Low Price Satisfaction Guaranteed or Your Money Back!